Marley broke what had become a tradition among many mixed-race people - to deny their African roots. He strongly identified as African. His home country of Jamaica had experienced colonialism and slavery for more than 200 years. Trenchtown, Kingston, was a working-class area where the most oppressed lived. It was fertile ground for the Rastafarian movement. The Rastafarian movement can be described as one of the most profound attempts at celebrating Africa's contribution to humanity and increasing consciousness, and it spread from the Caribbean to different parts of the world. Rastafarianism emphasised Marcus Garvey's teachings and the deification of Emperor Haile Selassie I as a symbol of resistance to white supremacy. 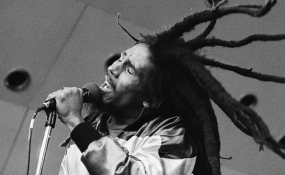 Bob Marley's character and music were influenced by his growing awareness of the political developments of the 1960s. Marley's career started in 1961, when he teamed up with Bunny Livingston and Peter Tosh to form The Wailin' Wailers. They transitioned from being "rude boys" to pushing the culture of defiance. From 1974 to 1981, Bob Marley took on the role of leader to many people in matters of truth and justice. He emerged as a Pan-Africanist, informed by the independence struggle of the Caribbean from 1950 to 1960. Despite the fact that Marley never declared any political interests, his music was reflective of the times. Music has a long and rich history as a universal language that musicians have used to wage war against the perpetrators of tyranny, inequality and injustice. Songwriters and musicians have long used music to uplift those who are exploited, downtrodden, subjugated, oppressed and persecuted. Marley used his music in similar ways to impact the lives of those who were needy and oppressed. To some extent, Bob Marley's songs were protest songs against injustice, slavery, inequality and racism. Scholars view American freedom songs created by enslaved African Americans and disguised as spiritual hymns as the "ultimate" in freedom songs. However, Bob Marley's songs delivered political messages of peace, racial harmony and protest par excellence. His music promoted notions of understanding and love, while at the same time confronting racism in a message of defiance. He sang about the struggles of African people while suggesting the need for Pan-African unity to overcome oppression. He had a clear message to Africans, which was "Africans, unite! We are moving out of Babylon." His famous song "War" was partly based on the speech made in 1963 by Haile Selassie at the United Nations.